Shawn is a 14 year old boy very much like others his age with his likes and dislikes. What makes Shawn diffferent is he has cerebral palsy. To the world he looks a seizure riddled body with no functioning brain. No one knows if he understands, sees or hears anything. This book is told from Shawns persepective. He knows he is loved. He also knows he is the reason his father left the family. His father believes he is in constant pain from the seizures. Now Shawn is afraid of what his father is going to do to him. Does his father plan on killing him? This book reminded me of a case we had here in Florida of a young woman who suffered a heart attack and then went into a coma. When they finally pulled the life support she lived on in a vegetative state. Years later her husband succeeded in having her feeding tube and everything removed to allow her to die. The governor and others stepped in trying to stop this. Her parents felt that she was still locked inside her head unable to communicate with them. This made me think about what I would feel and think and do in that situation or any similar situation. I have a living will that states if I am in a vegetative state with no hope of survival that I want them to pull the plug. Where do we draw the line though. Euthanasia is a very touchy subject. It is not something that most young people think about. 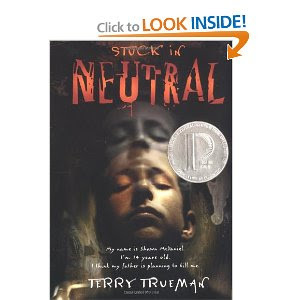 I think this would be a wonderful book to get them considering all sides. Shawn was a very believable person. I found myself angry with the way people treated him, yet I understood why they did. This will be a book that will stick with me for a long time. Excellent and I recommend it whole heartedly to everyone.